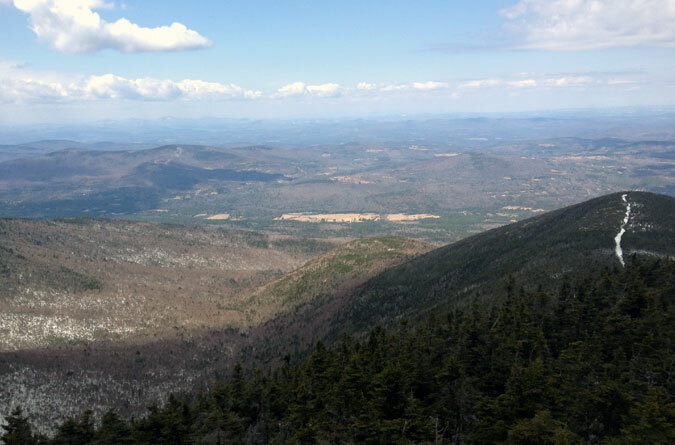 Cannon Mountain marks our first spring hike in the White Mountains, and I was pretty excited about it. The warmer weather, the sunny skies, the ditching of snow pants: I couldn’t wait to get out there. There had been some tales of somewhat difficult spring trail conditions tossed about (aka Ben telling me this season is the worst for hiking), but how bad can a little melting snow be? The forecast was calling for rain in the afternoon and the drop in temperature from base to summit of Cannon looked like it was going to be pretty significant, which turned packing the night before into a bit of a guessing game. We ended up stuffing enough extra layers and rain gear into Ben’s pack to outfit nearly everyone else we saw on the trail that day, but I guess that’s normal this time of year. At first, we had planned on traveling up on the Hi-Cannon trail, but, as noted above, it’s way less traveled and pretty much impossible to take on without snowshoes during this season. We were reliant on microspikes alone, and a quick test of the Hi-Cannon trail proved that we’d be wading through gobs of melting snow the whole way up. Instead, we sacrificed Hi-Cannon’s slightly shorter distance for the easier and more traveled Lonesome Lake and Kinsman Ridge trails. Snow? There was still plenty. 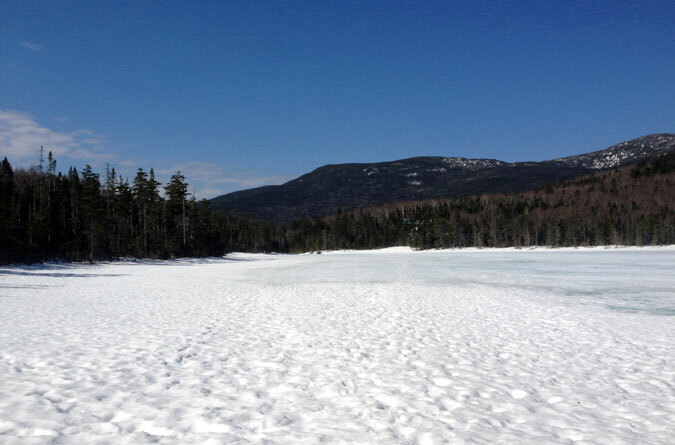 Lonesome Lake was also still sporting its winter coat. We started hiking around 8:45 am, so the snow was still pretty firm and reliable on the Lonesome Lake trail. Ben had casually mentioned something about “post-holing” and “monorails” common to spring trails the night before, but I was deep in a Netflix rabbit hole at the time and all communication attempts were pretty futile. For the first stretch up Lonesome Lake, we had nothing to worry about. The trail was similar to what we’ve experienced in February and March hikes, except it was 20 degrees warmer and the sun was out. It was a great start to the day. About 100 feet into the Kinsman Ridge trail, we both started to post-hole, big time. By post-hole, I mean collapse into waist-deep swaths of melting snow at an average of once every 28 seconds between the two of us. At first, watching your significant other step forward and face-plant into a pile of snow without warning is, predictably, hilarious. But do you know how embarrassing it is to face plant into your own pile of snow while you’re laughing at someone for doing the same thing? The novelty wears off with amazing speed. 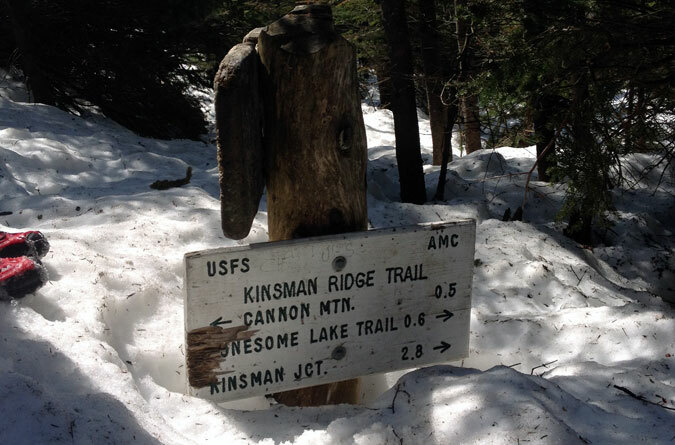 Because of the infinite post-hole possibilities, the entire length of the Kinsman Ridge trail became a balancing act. There was one, very-hard-to-decipher line of hardened snow packed in the middle-ish of the trail, and finding it and staying on it was the only way we were going to haul our snowshoe-less selves up Cannon. One step off to the right or left of the packed area and the soft snow would instantly give way. 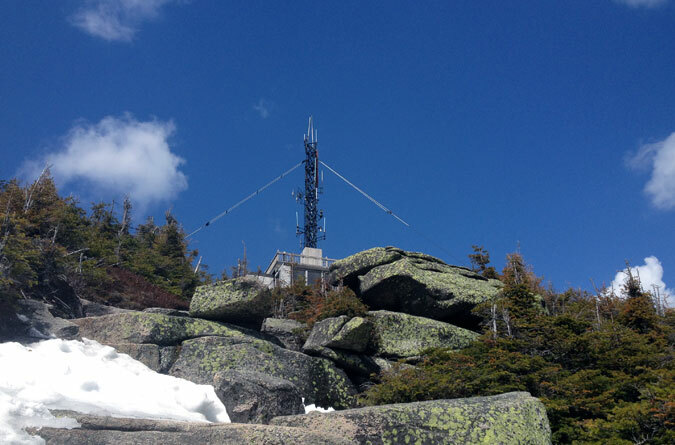 The Kinsman Ridge trail generally waffles between one of two extremes: flat and easy or vertical and exhausting. One enterprising, snowshoed hiker had warned us about the “ice wall” on Kinsman Ridge early on when we were hiking to the lake—we were actually pretty excited to conquer it—but it was really more of a couple of sopping wet boulders by the time we got to it in the late morning. It looks way less frightening than the February pictures above; we probably could have gotten by without microspikes to climb over it. There were some trickier parts of the trail (i.e., the vertical and exhausting bits) but it seemed to be a much easier climb than what it would have been in the deep winter conditions. At the summit, it was easy to forget all the tripping and falling we endured on the trek up in exchange for all the beautiful views available from Cannon’s well-kept observation deck. It wasn’t as cold, windy, or overcast as we were expecting and we were able to hang out for about a half hour at the top. We briefly considered taking the Hi-Cannon trail back down to the car, but, if anything, the sun had made the already soft snow even more difficult to navigate. We took the Kinsman Ridge trail back down (falling downward is actually more annoying than falling upward! who knew!) and, after that, followed the significantly more slushy Lonesome Lake trail back down to the car. But, all griping aside, the open views and amazingly warm weather made the hike well worth the second-day soreness. It was a good day for views on the summit. 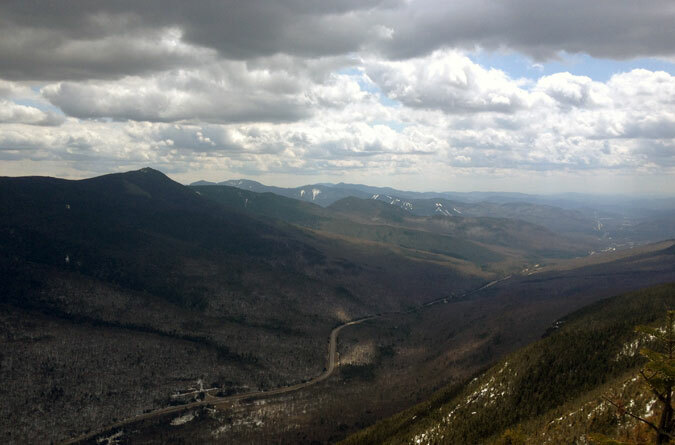 Looking down into Franconia Notch at I-93. 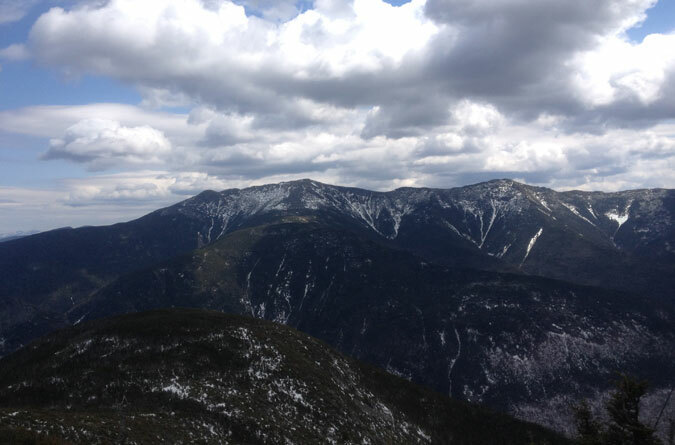 The view across the way of Franconia Ridge.